If there was a magazine called, “The New African Man,” Bruce would be on the front cover. 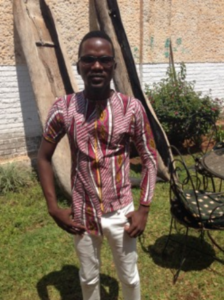 He was always in fashion, even as a kid, “In Malawi you are taught to gravitate towards white collared traditional careers.” Currently Bruce is employed as a district coordinator empowering girls in schools on how to avoid contracting HIV. What is your deepest value, the value that defines you? She invited him to come study with her. He also met Faida, another young woman you will meet next who motivated him and encouraged him when he questioned himself as a designer. He would go to his 9-5 job and then go work with Lily after. Like Mphatso and Faida he can’t say enough good things about their remarkable mentor and fashionista, Lily Alfonso. What is it like to not be on purpose given there is so much talk about young people finding a purpose? Each interview straightens my spine and opens my heart. Who are these young people? I am in awe and sit in stunned silence. I have said it before but when asked about what I am doing in Africa. My response now is, “ My liberation lies in Africa.” Teachers come in many diverse forms. These are my fashion gurus for life.